Everybody wants an organized home. Whether it is the clothes, accessories or shoes; you must keep them properly to stay organized around your home, while traveling or in office. There are options to store clothes and accessories well, the best shoe bag aids in keeping your leftover shoes properly. A shoe bag can be versatile and available in all different shapes and sizes. They are sturdy and help in stuffing your shoes and socks in an organized way. 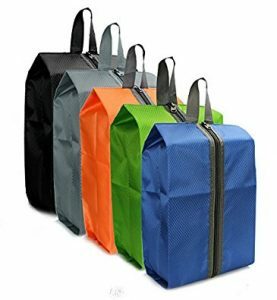 There are numerous shoe bags on offers online. 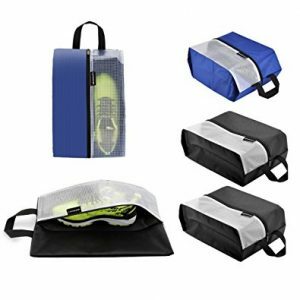 Here is a review of three best shoe bags prevailing in the market 2018. As the name says it all, ANPHSIN is a waterproof travel shoe bag which not only helps in storing your shoes but also keeps them safe from water and dirt. Available in two colors; green and black. Large enough to store all types of shoes and sandals. Made of clear plastic that helps you sort them from suitcases or travel bags. Made of PVC plastic which is nondurable. The Lermende tote bag pouch is made after thorough research done on what buyers actually want. Designed for both home and traveling purpose, the product is made of long-lasting superior nylon fabric. The size is perfect for both men and women shoes. Large enough to accommodate up to size 14. Accommodates both men and women shoes. Larger in size, waterproof and foldable. Made of nylon fabric which is durable enough. The translucent window design makes it see through and easier to sort among other stuff. Keeps your shoe bacteria free and dirt free. Not suitable for high boots. 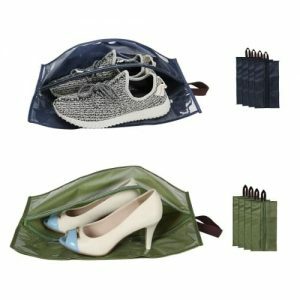 The multi-colored Zmart Printable shoe bag is one of the best shoe bags available online. Suitably designed to fulfill the taste of both men and women, this designer bag is lightweight and portable. Consists of 5 bags pack of different colors; blue, burgundy, red, navy and pink. Made of extremely lightweight fabric that makes it convenient to carry anywhere. Colorful options make it convenient for gifting as well. Comes with a 1-year guarantee, which is a great advantage. Accommodates only up to size 9 which is too small. Proper shoe care is a must if you have expensive footwear, the best shoe bags make your task easy and convenient. They not only help in storing shoes but allow storing smaller things like makeup, toiletries, and accessories as well.